One of the greatest accomplishments in the history of cryptography occurred in 1940 when a Swedish mathematician broke the German code used for strategic military communications. This story has all the elements of a classic thriller: a desperate wartime situation; a moody and secretive mathematical genius with a talent for cryptography; and a stunning mathematical feat, mysterious to this day. Arne Beurling, the man who inherited Einstein's office at Princeton's Institute for Advanced Study, was the figure who played this role at a crucial moment in world history. Though the cracking of the code from the Geheimschreiber (G-Schreiber) device is every bit as impressive as the breaking of the Enigma code by the Poles and English, this secret has been kept for over 50 years! Through the eyes of a former head of Sweden's signal intelligence organization, Bengt Beckman, the reader will learn about the events leading up to the breakthrough and make the acquaintance of not only a remarkable mathematician, but also a remarkable human being. The author, Bengt Beckman, for many years was the head of the cryptanalysis department of the Swedish signal intelligence agency. In writing this book, he made extensive use of its archives. He also interviewed many people who participated in the Swedish wartime intelligence effort. He describes in detail Beurling's attack on the G-Schreiber system as well as attacks on several other wartime crypto systems, noting high points from the history of Swedish cryptology. The book will appeal to a broad audience of readers, from historians and biography buffs to mathematicians to anyone with a passing interest in cryptology and cryptanalysis. This English edition has been translated by Kjell-Ove Widman, Director of Sweden's Mittag-Leffler Insitute. Also on cryptography and available from the AMS is Cryptography: An Introduction. General audience; readers interested in history, biography, mathematics, cryptology, and cryptanalysis. Credit is due to the American Mathematical Society that now an English translation, carried out with great competence by Kjell-Ove Widman, has appeared. The translation allows a wide general public with no knowledge of the Swedish language to compare the Swedish successes with the Polish and British cryptanalytic achievements against the communication lines of the German Wehrmacht. ... Beckman's book has completed the picture of the great cryptanalyst Arne Beurling. 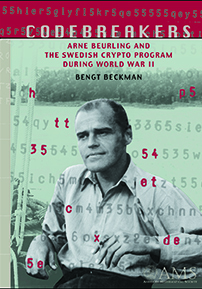 ... Bengt Beckman has produced a well-written, fascinating book showing the mathematician Arne Beurling ... as well as the part-time cryptologist Beurling in the depressing atmosphere in Sweden during the Second World War. This is an unforgettable book, even for those not addicted to cryptology. If you are interested in the history of cryptography, or perhaps even in history in general, then you'll find much to enjoy in this book. ... The book presents the history of Swedish cryptography well; but where it truly shines is in the stories of the people. Not just stories about Beurling, but of many of the other characters as well. Stories about the cryptographers dealing with military bureaucracy, their working conditions, the occasional public gaffe, and their methods for getting the job done in less-than-ideal circumstances, make for some fun reading. All stories about cryptanalytical work prior and during the World War II read like a thriller. The book under review is no exception. The author, the former head of the cryptanalytical section of FRA (The Radio Agency of the Swedish Defence Forces), presents a well of information. Its highlight is the detailed description of Arne Beurling's solution of the German Siemens machine, one of the most magnificent achievements of cryptanalysis of that time. ...The book can be highly recommended to anyone interested in the role of mathematics in classical cryptology and in the history of the 20th century. Many interesting chapters in this excellent book … This book provides a valuable contribution to the history of cryptology with much new information and added respect for the cryptanalytical achievements of Sweden's signal intelligence agency. It certainly belongs in your personal library. This is a terrific book that belongs in your personal library. The present volume is an excellent illustration of the best kind of popularization of a complex, technical subject, in this case, Swedish wartime cryptanalysis. Bengt Beckman … a grey eminence with Sweden's Sigint organization … has been permitted to twitch the company veil and show what his colleagues got up to during World War II … the reader is gently introduced to the basic ideas of cryptanalysis before coming face-to-face with the Geheimschreiber … Merlin the Magician, in the shape of Arne Beurling … uncover[ed] the structure of the underlying cryptosystem and … [was able to] identify its vulnerabilities, thus ensuring a steady flow of decrypts … The resulting intelligence was used in framing Swedish wartime policy in the fields of defense, diplomacy, economic negotiations, and counterespionage … The abiding presence of Arne Beurling is felt throughout the book. It therefore fittingly closes with a portrait of this brilliant but quirky hero seen throughout the eyes of colleagues, students, and friends.